Chicken and dumplings comes in any number of regional variations—Southern, Midwestern, Pennsylvania Dutch, New England-style; in other words, it’s an all-American dish. What’s more, it’s good, old-fashioned “plain” fare, the kind of warming, memory-filled dish that never goes out of favor. I confess I never make it the same way twice—sometimes I use fennel instead of celery, or rosemary instead of parsley. Sometimes I add mushrooms or peas, or enrich the sauce with cream. You, too, should feel free to vary it—that’s the American way. 1. Rinse chicken pieces and pat dry with paper towels. Dredge chicken in seasoned flour, shaking off excess from each piece. Heat a large, wide, heavy pot over medium-high flame for 2–3 minutes. Add half the olive oil and butter and swirl to coat the bottom of the pot. Brown the chicken pieces in batches in the pot, adding a bit more butter and olive oil as required. Remove browned meat to a platter. To make dumplings: Whisk flour, cornmeal, parsley, baking powder, and salt in a bowl. Stir in Half & Half until just blended. 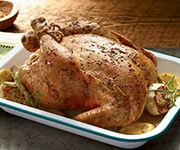 Drop 8 spoonfuls of batter onto simmering chicken; cover tightly and continue cooking over low heat 15 minutes. 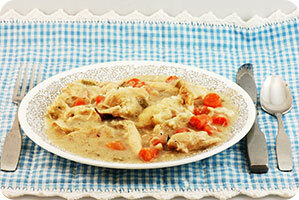 Serve chicken and dumplings in wide, shallow bowls. Garnish with herb sprigs.